For companies and business establishments, it is very important for the proper evaluation of work applications to take place. The competition in different industries is becoming very stiff. Today, where the totality of the candidates is looked at during application, companies are becoming more keen on how they evaluate possible employees. Preparation is not only done on the part of the candidates as businesses also need to ensure that they are properly armed with documents and tools that can help them identify the person fit for the job that is open for employment. The workforce is one of the major factors that can affect the entire operations of the business. This is why performance evaluation forms are always used for varying time duration. In the interview processes, however, there are also evaluation forms that are necessary to be used. Aside from the results of the work examinations, the interview phase of the hiring process should be assessed accordingly to ensure that the most qualified candidate will get hired. Refer to the samples of interview evaluation forms that we have put together in this post so you can effectively create your business’ own interview evaluation document. 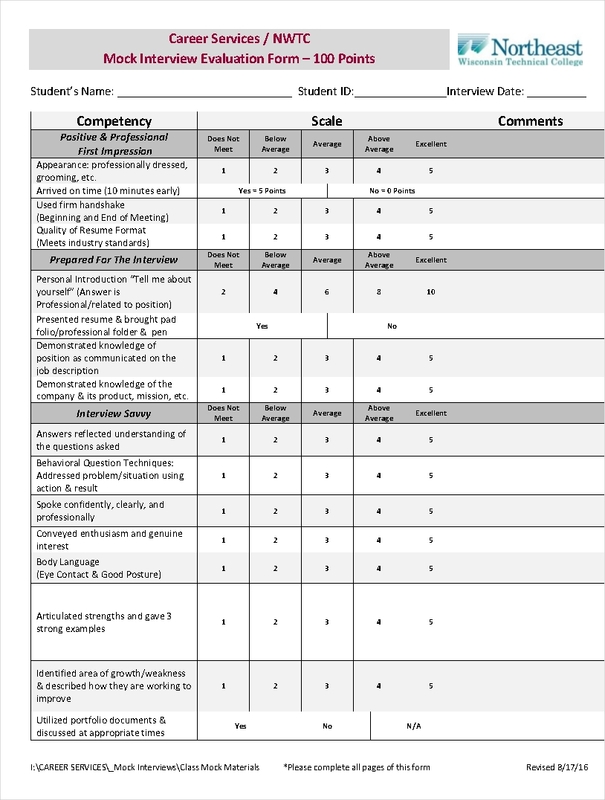 How Does an Interview Evaluation Form Promote Objectivity? 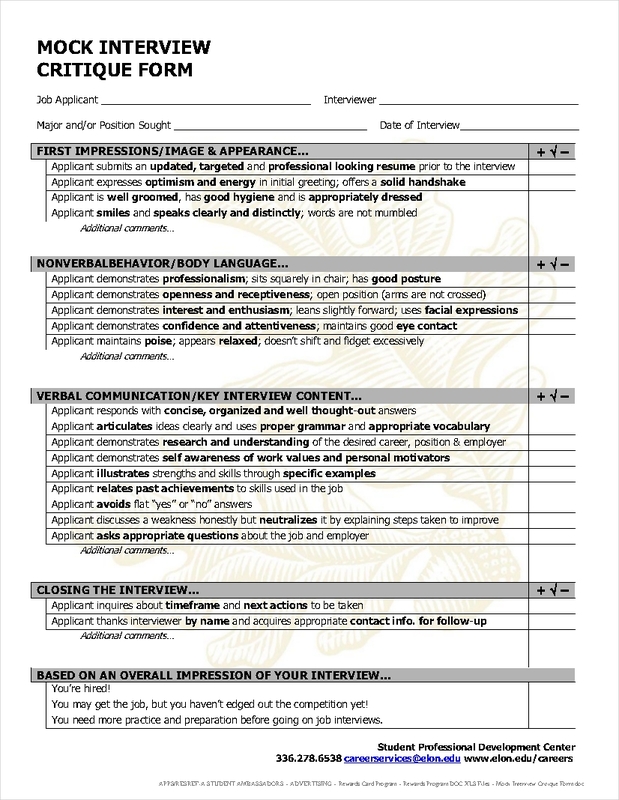 The usage of an interview evaluation form can make the interview process less subjective. It is true that the interview processes produce results that are hard to quantify. This is the reason why hiring procedures are considered as subjective. However, through the use of proper metrics, companies can lessen or even eliminate the subjective nature of interviews. If there are proper guidelines that will be followed, then it will be easy to identify who really stood out among the candidates in this particular hiring phase. 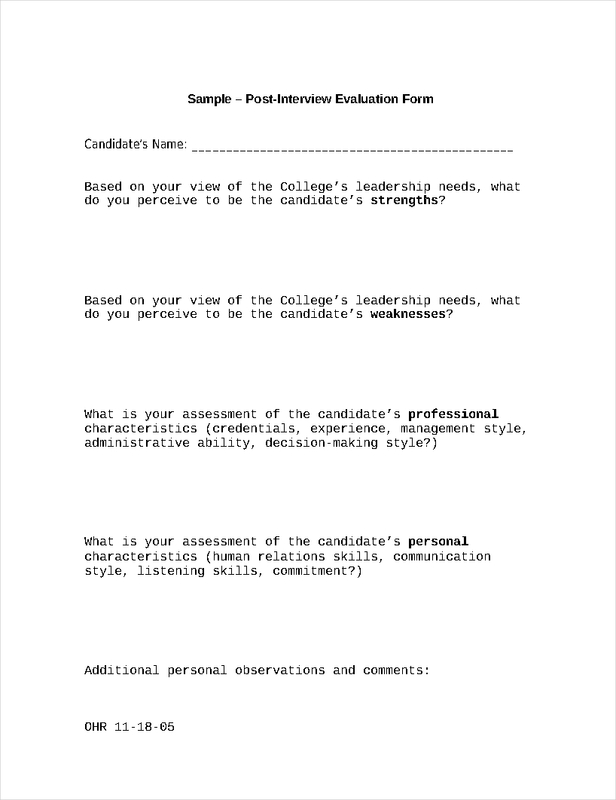 The usage of an interview evaluation form can help the human resource department separate the candidates according to their interview performance. If you have a solid foundation or basis for comparison, then you can easily identify who answered well during the interview sessions. With this, candidates can be separated based on the average score that they have received from the interview panel or personnel. With the items presented in the interview evaluation form, the human resource department will have an easier time to remember the applicants who truly stood out and answered the interview questions more impressive than the rest. 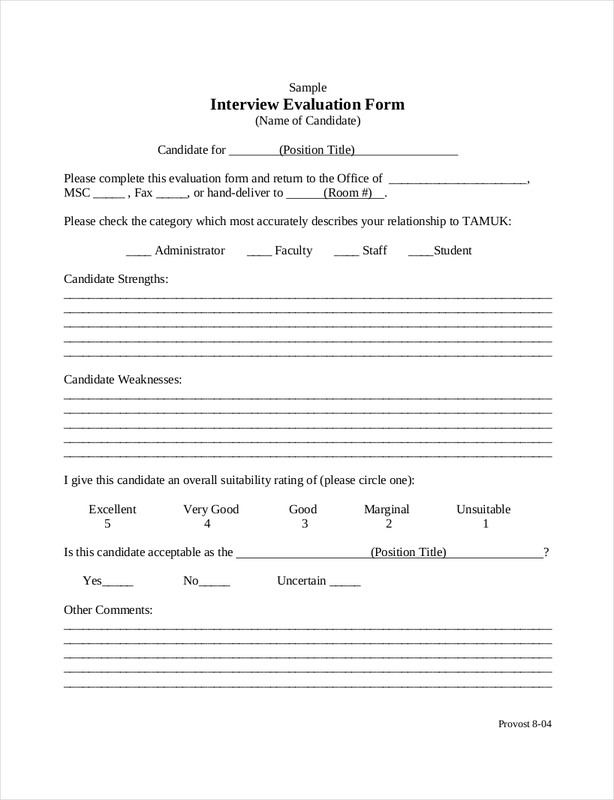 The usage of an interview evaluation form can easily quantify interview results. Since the metrics that will be incorporated in the interview evaluation form are pre-determined, the management will have enough time to organize the measures that will be used for the results to be based on the objective grading of the candidate’s performance. There are different ways on how this can be done and it will depend on the regulations that the business will follow. 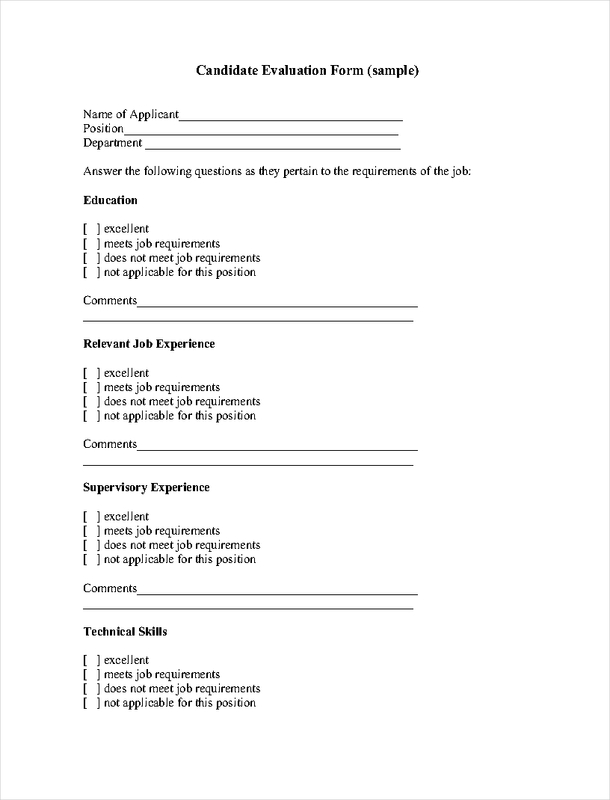 The usage of an interview evaluation form can help the hiring personnel to not take anything personal. 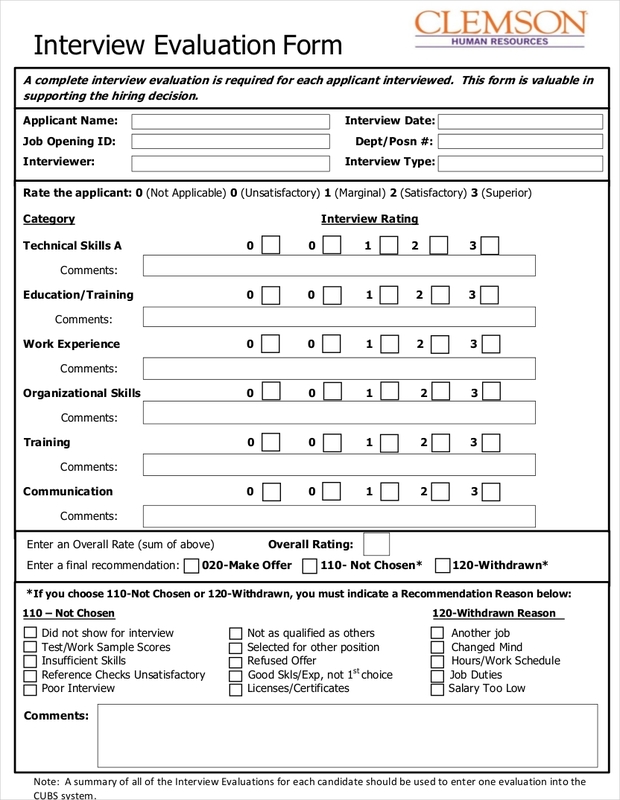 With an evaluation form at hand, a hiring personnel will be guided on how to grade or score candidates accordingly. This will also ensure the candidates that even if the hiring personnel is having a bad day or is in a bad mood, the results of their interview will still not be affected. The hiring manager or anyone who will do the interview should be knowledgeable on the pre-determined metrics that will be used for the interview. Whoever will do the interview should not only be aware of the evaluation measures. He or she should also have an idea on how to properly give scores to each candidate. If there is cohesion with how the measuring of performance takes place, then the management can ensure that there is objectivity given to all applicants even if they got interviewed on separate days. The objective metrics should be applied every single time there is an interview. Again, the mood or personal problems of the hiring personnel should not remove the objectivity in the entire process. Companies should train their interviewers when it comes to defining the difference of rating a candidate a “10” and when it is necessary to grade them lower than the maximum score. Weighed attributes can help businesses hire a candidate for his or her strengths. As an example, if communication skills are very essential for the then job, then the assigned number to the communication skills attribute can be multiplied to the raw score of the candidate during the interview. This will then give you a weighted score that is essential to be considered for the specific job that the candidate is applying for. Since there are differences when it comes to the qualifications of applicants, creating a weight for each attribute can help the company to not look for lack of weaknesses. Even if a specific candidate looks outstanding, if his or her qualifications are not relevant to the work position then there is a big problem that might occur if he or she will be hired just for not having any negative traits or weak spots. Again, the weight of what you are specifically looking for in a candidate can make or break this entire process. Lastly, you need to create measures on how you can interlink the interview results to the actual deliverable of the candidates. This means that you need to assess whether what they have specified in their interviews have something to do with their actual experiences and the items that they have presented in their professional profiles and application letters. Interview results should be reviewed so you can ensure that all items are aligned with each other. Again, the inclusion of these items may vary depending on the format or layout that the business will use. This will also depend on the interview regulations followed by the business as well the as the job position that is needed to be filled to continue the smooth flow of operations. Make sure that there will be a meeting with the management and the specific departments with regards the evaluation questionnaire, metrics, attributes and attribute weights that will be used during interviews. 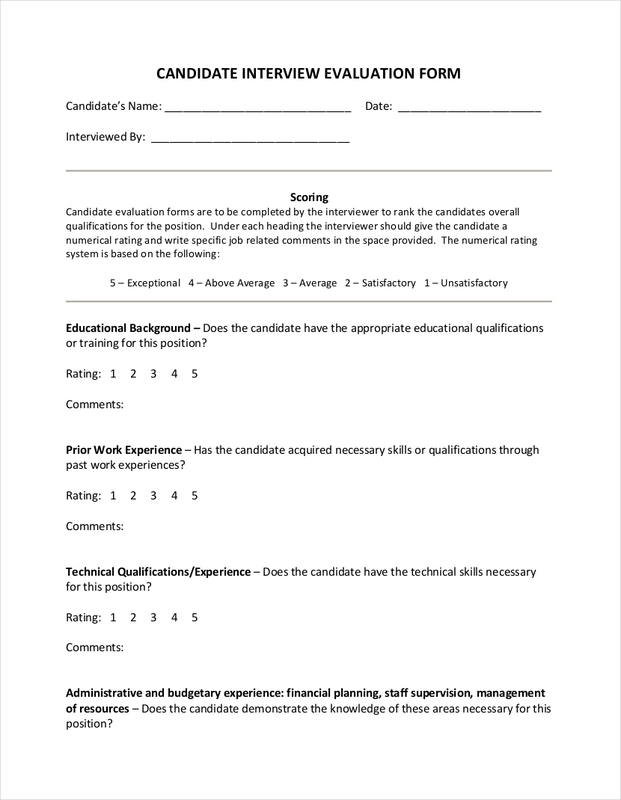 You may use recent interview evaluation forms and update it based on the changes in the operations or the improvement and updates of the job qualifications and requirements necessary to be reached by the candidates. 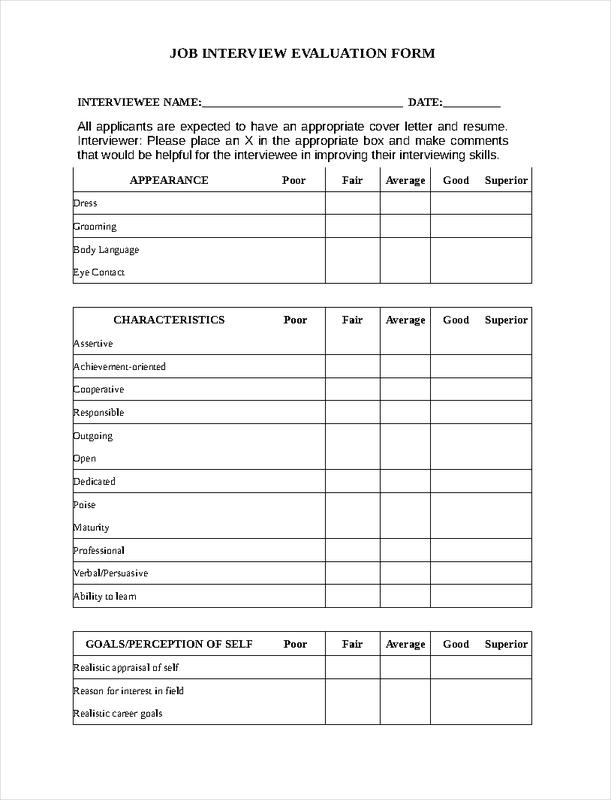 Refer to samples and templates when creating an interview evaluation form so you can identify the common traits that are present in these documents. More so, this will allow you to find the right fit for your operations. Keep in mind that an interview evaluation form is a very important hiring document. Hence, you need to make sure that you will review and assess the document and the results that it can provide even before using it for actual interview processes. Having a comprehensive and put together interview evaluation form can help the business a lot. For one, it can ensure the company that they can hire an employee who is truly worth it for the position. The professional profiles of candidates can truly make a difference in how they are perceived by employers. However, face-to-face interactions can either support that initial impression or the other way around. Ensure that you will come up with an interview evaluation form that is fit for the candidate that you are specifically looking for. Refer to the samples that we have for you so you can use them as guides in the future or even if you need them right away. Aside from that, always be mindful of the things that we have discussed so you will not fall into the trap of creating an ineffective interview evaluation form. Having the best employee starts with his or her proper identification – and that, as a business, is your responsibility.